A U.S. State Department spokesperson has said that in the coming week the government will announce a travel ban to North Korea (DPRK) for all U.S. citizens which would come into effect 30 days later. 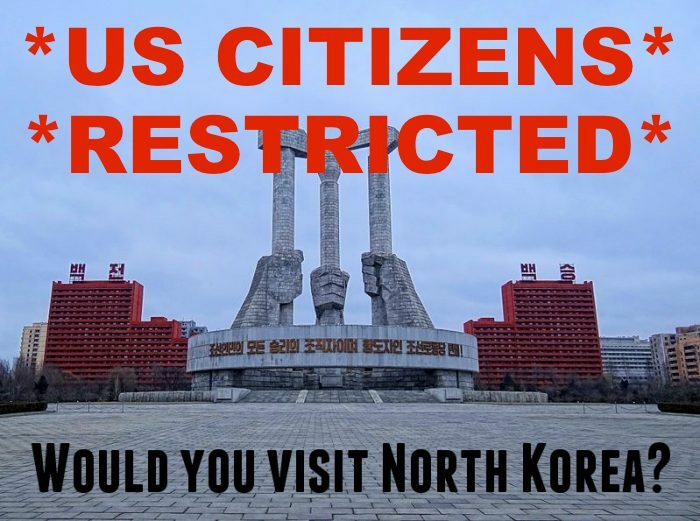 Prominent tour operators that organize tours to North Korea have already stopped accepting U.S. citizens for their tours following the death of an American who was imprisoned during such a trip. It’s no secret that tensions have been high between the DPRK and pretty much all other countries on the regional as well as worldwide stage. The matter of the American student who has apparently been mistreated during his imprisonment to a degree that eventually caused his death only made matters worse. The U.S. government has now drawn the first consequences and will prohibit all U.S. citizens from traveling to North Korea. Yesterday the BBC (access here) reported about it as soon as that announcement was made. US officials linked the move to the death of jailed American student Otto Warmbier. … Mr Warmbier travelled to North Korea with Young Pioneer Tours. He was arrested in 2016 for trying to steal a propaganda sign and sentenced to 15 years in prison. He was returned to the US in a coma in June and died a week later. Our friend Freddo has visited North Korea a few months ago and wrote a mini series about his adventures there here on LoyaltyLobby (see the introduction here). He did not travel on an American passport though and I’m not sure if that is recommendable for any U.S. citizen in times where possible military action is under consideration. Freddo went with Young Pioneer Tours, a company which is also mentioned in the BBC article. After the death of Mr Warmbier, the China-based Young Pioneer Tours announced it would no longer take visitors from the US to the country. The statement of Koryo Tours sounds like a bunch of rubbish to me. The tourists that are going on these tours are not getting in touch with every day, common North Koreans who would benefit from a sort of cultural exchange. All tours are guided (tour guides are intelligence/military), mostly isolated from the population. They pretty much say that their profit is more important to them than the safety and well being of their customers. I find the approach of Young Pioneer Tours more responsible and it’s better to avoid any possible controversy from the get go – even as a tour operator. Having your customers imprisoned is simply bad for business! I’m not against visiting North Korea, quite the opposite. I do however find that it’s unnecessary to take risks above and beyond whats reasonable and traveling to certain places where the risk originates pretty much from your citizenship alone is not what I would advise. U.S. citizens have been the target of kidnappings and politically motivated imprisonments for decades and these are difficult times once again. To bring such legislation forward at this time could have reasons beyond just cutting off funds to the North Korean regime from American tourists. Another factor might be that the government wants to ‘clear out’ the country of their own citizens before a possible military intervention. Previous articleReader Question: When IHG Rewards Club PointBreaks For July 2017 Are Out?